Yeah, but: The world's biggest seller of cooked hot-dogs can't be all bad. 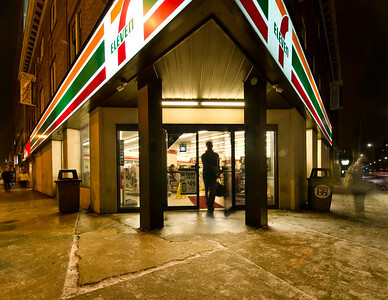 The Long Version: 7-Eleven always makes me think of William Gibson's Bridge trilogy, in which the convenience store chain Lucky Dragon plays a pivotal role. They're in places where they probably shouldn't be, and at one point security guard Berry Rydell realizes that it's the only store for miles that actually sells anything that anyone actually needs. But downtown Toronto isn't a dystopian society that has broken down after a catastrophic earthquake - we're temblor-free. And within a block or two of the 7-Eleven at Bloor and Spadina there's all kinds of food stores, Chinatown, discount retailers, heath food supplies, and the most expensive shopping district in the city. So it's not like there are no other options. 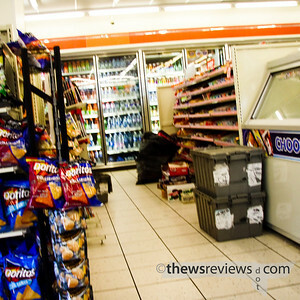 There are even several other convenience stores, coffee shops, fast-food places and donut stores, most of which are cheaper and/or better than 7-11, several are open 24 hours, and are all within a few dozen metres of the intersection. In one way or another they all sell some of the same things that the Seven-Eleven does. But they're not actually on the corner, or they don't have the bank machine, or they don't routinely put their 2L bottles of coke on sale. 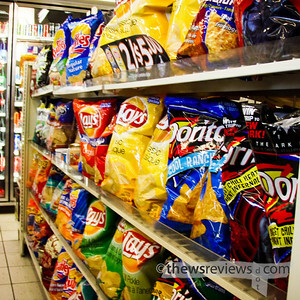 So 7-Eleven isn't always the best choice, doesn't have the happiest employees, and doesn't usually have the lowest prices. 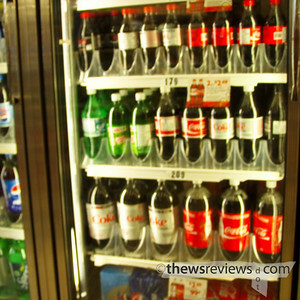 It is convenient, brightly lit, and sells just about everything. But they don't call them "happy employee and low prices" stores, they call them something else. But 7-Eleven is similar to Gibson's Lucky Dragon in one other way: both attempt to saturate and control popular culture. 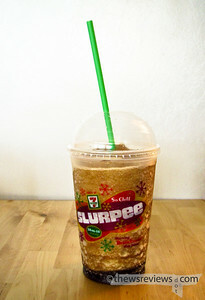 Naturally, a large corporation has its own web site, but so does one of it's products: slurpee dot com. 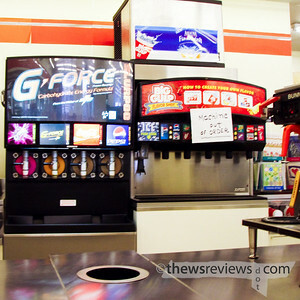 And like Luke Skywalker, 7-Eleven has its own day to celebrate its existence - July 11 - which happens to be today. That's not a big deal, if Coke had a numeric name, I'm sure they'd do it too. But what really amazed me is that 7/11 has made a registered trade mark out of the term "brain freeze." That phrase currently gets half a million hits on Google, and two out of the first ten are related to 7-Eleven. I wonder if the rest are using it with permission?